My Tuesday Ten's usually consist of things, places, facts and favorites. But TODAY it is a little different, TODAY it's personal, TODAY... it is the best one yet. Question: Do you technically only turn a year older at midnight, in the time-zone in which you were born? And if that is the case, what if you weren't born at midnight? Or what if you were born in Paris, but have now moved to Dallas, Texas? Not that this is the case but, shouldn't there be a rule or rhyme? Why must it be such an in depth question that no one can answer, because no one was around for the starting of birthday's? The thought only occurred to me today on the day of my sister's birthday, because I have never really thought much about birthday's in general, besides the ol', "what should I get her" or, "how old will she be"? So, if you haven't guessed it by now, this Tuesday Ten, is about my beautiful big sister, Heather, the daughter to Lynita and Bob Elkin, the Sister to Me, Savanah, Robert and Chase, the Wife to Tim Farmer, The Mother to Landon Famer and the HIGHLIGHT OF THIS TUESDAY TEN! 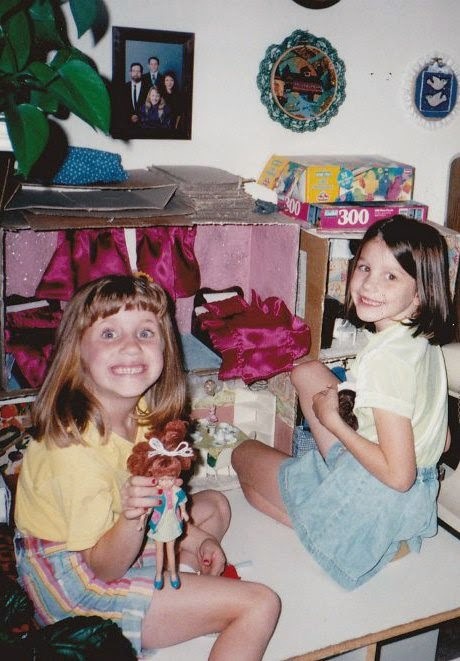 Though there are so many memories that came to my mind when I was thinking about today's post, these are ten of my favorite memories with Heather, of all times, forever. 1. The Pink Power Ranger - I thought I would start with this, something that is told time and time again, but I don't think is given the correct light. Some people say, it's because I'm the bossy one, ha! Others could say, it's because she was, the best big sister ever, you choose. With my, THEN favorite color being pink, and the Pink Power Ranger being, THE COOLEST, we would wake up on the weekends to watch The Power Rangers TV show. We would then, as most kids do, begin to act out and create our own version of what was happening. Heather, who was never one to say no, would let me be the pink one, time after time, without complaining. Most would say I was mean, but she would let me be the pink one, and always have my back when dragons or monsters would come to play! I think she still let's me be the pink one... she let's me be the favorite, but she knows deep down inside that I just want to be just like her... so she doesn't mind. 2. The Clean Our Room Game - On a weekly basis our mom would let us know that it was time to clean our room, if we wanted to do anything on the weekend! So there we would be, kids with toys... trying to clean it up, in the quickest way we knew how! So me, being the creative one, would say "Let's play a game! Let's put all of the toys in the middle of the room and then we will take turns putting as many toys away in 30 seconds as we can". And it would work, though, one person would have to standing with their face against the wall, counting... Now, I am not saying that I would not clean, but I am saying that Heather would do the majority of it! But there is nothing better than a little sibling rivalry. 3. Friends - As we got older and were aloud to have a TV with cable in our room, we began to be given more trust, more trust that would allow us, more radio time, later bed time and even more privileges with our friends! Heather has always been an old soul, one who likes to stay up and watch Fraizer, SNL, Friends or anything that mom would like.. so of course, I would too, because she did. So, when "bedtime" rolled around and mom did her walk through, Heather would casually turn on the TV as she left the room... and while I would be dying to watch Rip Gurls on Disney, I didn't want to look like a baby to my, beautiful big sister Heather, so I would tell her, Friend's it is! And we would watch until we fell asleep! I still like to watch Friend's when I get scared at night, but SHHH... I am to old to get scared. 4. Fashion Show - For Heather's birthday one year, she wanted to have a fashion show. I am not to sure if this was Mom's idea... or Heather's... but anyways, it was a GREAT day! Heather had invited, her best friend Emily, our neighbors, Cherity and Holly, Brandi and Lauren, our cousin's and of course our baby sister Savanah. Mom and Aunt Regina did our hair all nice and beautiful, put make-up on us, let us wear her clothes, heels and jewelry and then the show would begin! We walking through out the back yard, down the diving board and back in to the house! We got to listen to music hang out with our favorite people in the world and just be kids. Those are the best memories, just being kids, our parents gave us the World when they could, and having a big sister like Heather to look up to, made it even better. 5. We Are Real Sisters, Just 6 Months Apart - When Heather was 11, my dad adopted her. Making her a real sister. To me, she was always my real sister, and since her mom was also My mom, (1 of 2), from that moment, we were REAL, real sisters. And it was one of the best days I can remember. I remember telling my friends at school, that I was getting a real sister. People already knowing that Heather was my sister, the were confused. But from then on, no one knew any difference. I have probably spent 6 months of my life trying to explain to people our story... but after thinking about, she is an alien anyways so it's okay if other people don't believe it! 6. The List - Most children are rude and obnoxious, but Heather and I were not! But, we may or may not have been a little tricky! Our mother tends to say a lot of very strange sayings such as, "The pot calling the kettle black" or "Proof is in the pudding" and at one point, Heather had a list going! It was the funniest most amazing Diary of a Mad House Mom, a little Medea fun! Ha! And it was so neat, not the fact of laughing with Mom, but the fact that we were constantly laughing about something! 7. Ashlee Simpson on Valentines Day - One year for Valentines day, Heather, though she had a boyfriend, took me to see Ashlee Simpson, my all time fave, at a Walmart 30 miles away! For most, this would be nothing, but for me... it was everything! It had been a tough year for me, and it was only the beginning, but then it also meant so much because, my sister, chose me over her Valentine. She made my year, and it was by far one of the best Valentines to date! 8. "My Parents" - When I decided which college I would attend, they made me go to a Parents Day, where they showed me around! Since my parents were busy, Heather and her boyfriend at the time, now husband, stood in and acted as my parents! To some, this was dumb and completely outrageous, but to me... she was there for me, and we had fun pretending! 9. Little White Chapel - On a whim, I moved to Vegas, and thennnnnnnn it was time to come home! But when my darling Mother and Sister volunteered to fly down and drive back with me, it was the best time to visit some awesome places that I hadn't got to yet! We stayed in a beautiful hotel, visited the little white chapel and had a girls night in Albuquerque. There were so many things that we got to do, that reminded me why she has always been there for me, and I finally got to see when Britney and K-Fed got married. 10. She Became A Mom & A Wife - Though we are just 6 months apart, she grew up sooner than me. She became a Wife to a great man and a Mom to a healthy son, all while I am here playing with my dog and learning new hair tricks. She continues to amaze me everyday, growing and maturing as a mom and wife. This is what she is meant to do, run a family. She is teaching me daily what it is like to face the tasks at hand and how to do them with love and character. I dream to be like her, to have some of the same wifely, Godly and Motherly traits that she has. She is a dreamer, believer scholar and achiever, she is my best friend and my favorite person in the World. So happy birthday Heather, you're the best! I hope this one is the best, it's your first as a mother, and that only means the best is yet to come. What are some of your favorite family memories?